Looking into the exhibit booth, you see sales staff processing orders. Standing in front, is a gray-haired CEO whose eyes are fixated on the hands of Magical Balloon-dude Dale. He watches as a red air filled tube twists and twirls, until it transfers into a visual work of art. In the aisle, perspective customers are gathering, watching, listening, and participating in the presentational entertainment. Your ears detect a balanced sales pitch between professional product representative and the good-humored entertainer. The sales staff is communicating with clients, gathering leads as foot traffic stops in the aisle. Fill out the forum to right and start learning how to get the greatest ROI on Trade Show Lead Generation with Funny Business. 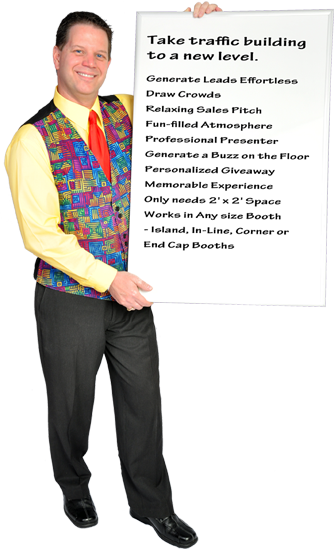 Learn How Get a Better ROI on a Trade Shows the Funny Business Way!